Dear Friends – As an avid fisherman, I have seen firsthand the impact of drought, fire, warming waters, and low river flows on salmon and steelhead making their way upstream to vital spawning grounds. Fish need a healthy ecosystem comprised of good water quality, streamside vegetation, and instream habitat for survival. Unfortunately, human actions through generations have degraded streams, rivers, estuaries, and coastal environments. Human-caused factors and recent devastation from natural events have contributed to a dramatic decline in salmon and steelhead. 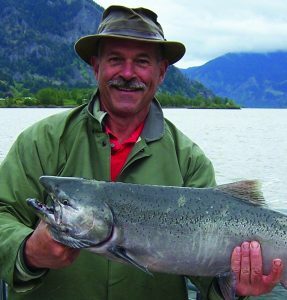 As the President of the Board of the Regional Fisheries Coalition, I volunteer hundreds of hours every year in support of our collective mission to restore sustainable populations of native salmonids by enhancing habitat, providing public education, and promoting recreational angling. Now is the time, more than ever before, to prioritize habitat restoration in salmon recovery. Healthy, robust habitats maximize the potential for all fish and wildlife during normal conditions, and provide buffers against population declines during high-stress periods. We play a prominent role in habitat restoration by engaging citizen volunteers and landowners. Volunteers across the state have logged millions of hours since the creation of the RFEG program in 1990. Since then, RFEG accomplishments have evolved from small-scale fish propagation and riparian projects, to complex and expensive salmon habitat restoration projects that benefit multiple, ESA-listed and non-listed species, stakeholders, and the public. Over the last 25 years, RFEGs have leveraged base funding through volunteerism and donations at a rate of at least 7 to 1. This “boots on the ground” model stretches every dollar of public investment and makes a significant impact statewide. However, the fee structure that supports the program has remained unchanged since the program’s inception. Increased capacity funding for the RFEG program is needed to not only maintain current service levels, but also to enable the expansion of needed projects, monitoring, and public outreach activities: a solid investment in salmon recovery for future generations of Washington residents.